Unless his reign is short, a Roman Catholic pontiff will appoint most of the men who vote for his successor. But Pope Francis’ additions to the College of Cardinals since his election in 2013 also have served another purpose – tilting the leadership structure of the Roman Catholic Church away from its historic European base and toward the “global south” – that is, developing nations mostly in the Southern Hemisphere. The pope recently announced that he will appoint 11 new voting cardinals. After this latest group is elevated at a June 29 ceremony in Vatican City, the College of Cardinals will have 125 voting members, 42% of whom are European, down from 52% in 2013. 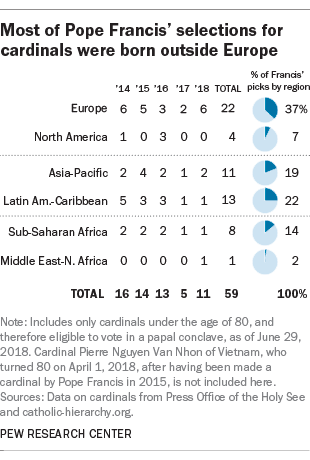 Of the 59 newly appointed or currently eligible voting cardinals Francis has named so far during his papacy, 37% were born in Europe, 22% in Latin America and the Caribbean, 19% in the Asia-Pacific region, 14% in sub-Saharan Africa, 7% from North America and 2% from the Middle East-North Africa region. The newly appointed class of voting cardinals is actually more heavily European than any of the four previous groups selected by Francis, a native Argentinian who is the first pope from outside Europe since the eighth century. 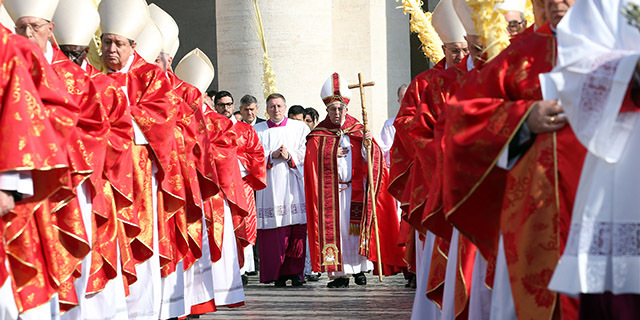 Six of the 11 new cardinals were born in Europe (three from Italy and one each from Poland, Spain and Portugal), while two were born in the Asia-Pacific region (Japan and India), one is from Latin America and the Caribbean (Peru), one is from sub-Saharan Africa (Madagascar), and one is from the Middle East-North Africa region (Iraq). None are from North America. 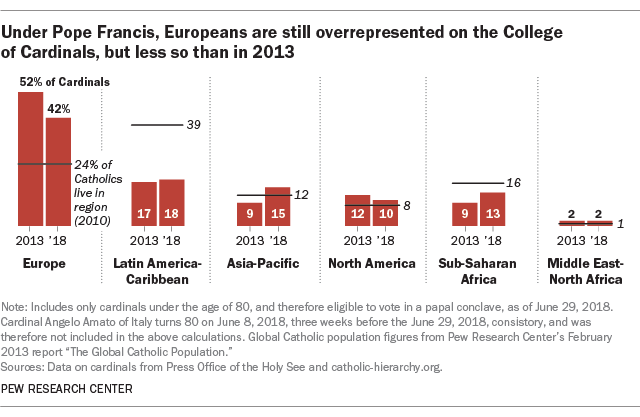 Given that, as of 2010, only about a quarter (24%) of the global Catholic population is from Europe, the continent remains heavily overrepresented among voting cardinals. By this measure, the most underrepresented continent within the church’s leadership (even with Francis’ new picks) is Latin America and the Caribbean, which is home to 39% of the worldwide Catholic population (again as of 2010) and has 18% of the cardinals. Francis’ appointments have increased the overall representation for the Asia-Pacific region (from 9% in 2013 to 15% in 2018) and sub-Saharan Africa (from 9% to 13%) within the body of voting cardinals. These figures include cardinals who were named by St. John Paul II and Pope Emeritus Benedict XVI. Note: This is an update of a post originally published Nov. 17, 2016.